Initiate. Educate. Innovate. : #IMMOOC Part 1 Reflection: Would I want to be in my own PD? #IMMOOC Part 1 Reflection: Would I want to be in my own PD? #IMMOOC Part Reflection: Would I want to be a participant in my own PD? I recently attended and presented at an educational conference with a focus to "meet the needs of young adolescents as [we] prepare them to become successful global citizens of the world." The expectation was that attendees would learn from, collaborate with, and network with colleagues from all over the state. Unfortunately, like so many educator professional development opportunities, the majority of sessions I attended were the traditional "sit-and-get." In my mind, this was not the collaborative, participatory networking I assumed would be taking place. Bummer. Driving home from this conference is when I really made a deep connection between the "Critical Questions for the Innovative Educator" and the importance of applying these in all educational settings... not just for students, but also for teachers. Would I want to be a participant in my own professional development sessions? In asking this one initial question, I feel like I am prompting myself to create new and better trainings for the schools and teachers I serve; I am reminding myself to take on the characteristics of someone who has an innovator's mindset. The conference session I presented was scheduled for the very last session of the day. I, and many other attendees, had been sitting, listening, and not doing a lot of collaborating and participating for most of the day. So when it came time for me to present, I was ecstatic... this would NOT be a "sit-and-get" session! Opportunities to get out of your seat and move! By designing my training sessions using these elements, I feel like I can almost answer "YES!" to the question of would I myself want to participate in this type of PD or not. One other question I almost always ask myself is: What are some ways I can create a true learning community in my PD sessions? 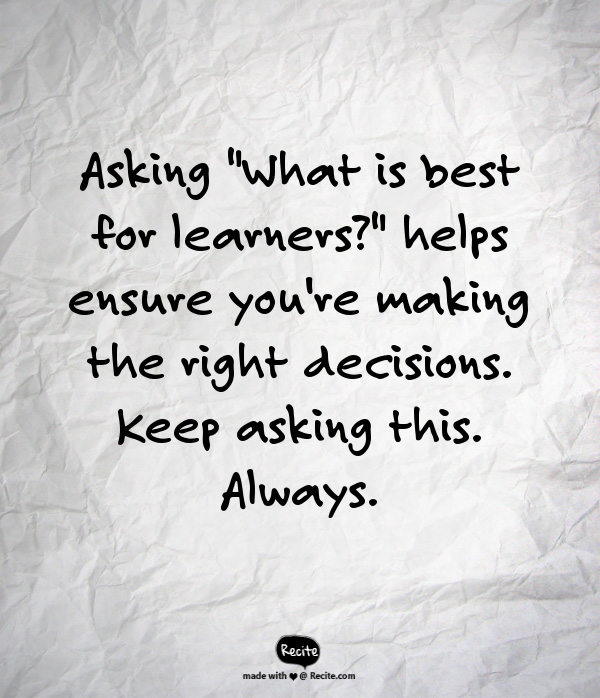 So often the educators who attend my sessions and trainings look to me to have all the answers, examples, and ideas. Again, that's the traditional way of thinking about teachers in their classrooms and presenters at conferences/PD sessions. But like George Couros says in Chapter 2, "What would be beneficial for our students and ourselves is to have them tap into one another's expertise... By embracing the idea that everyone in the classroom is a teacher and a learner, we can create a community that learns from and teaches one another." By asking this question, I am reminded to build in specific opportunities to share, collaborate, and learn not just from me, but from all of the other "experts" in the room. There's no way I can have all the answers, ideas, and examples for every grade-level and every subject area, but someone in the room might! 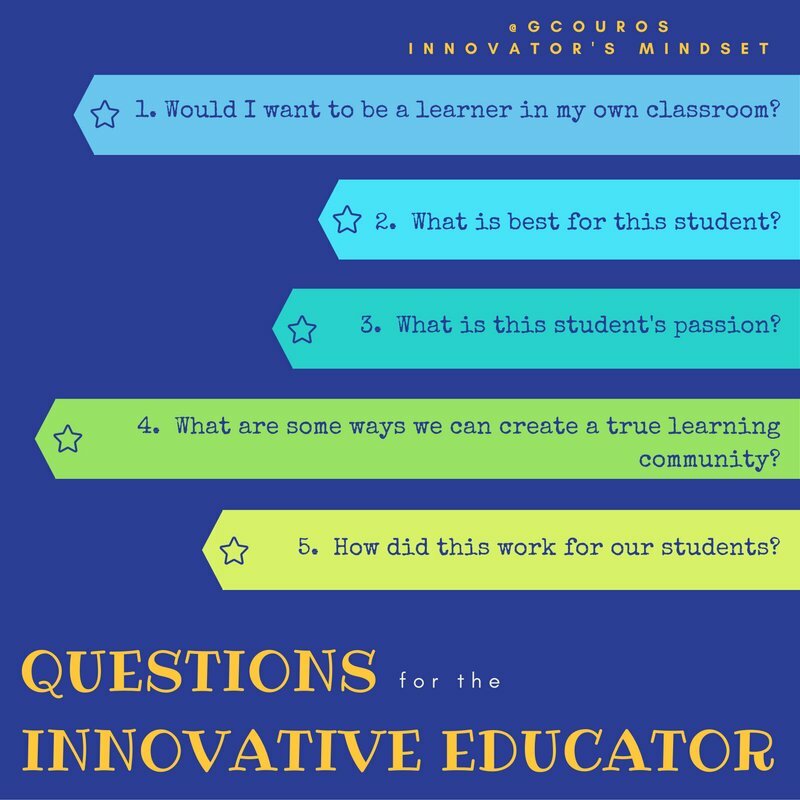 Moving forward, I hope to continue asking myself these critical questions, and designing trainings that are best for the schools and teachers that I serve. What works for one school and set of teachers, may not be what's best for another. If I'm able to model these qualities for those who attend my trainings, then hopefully this will become what teachers model for students in their classrooms. 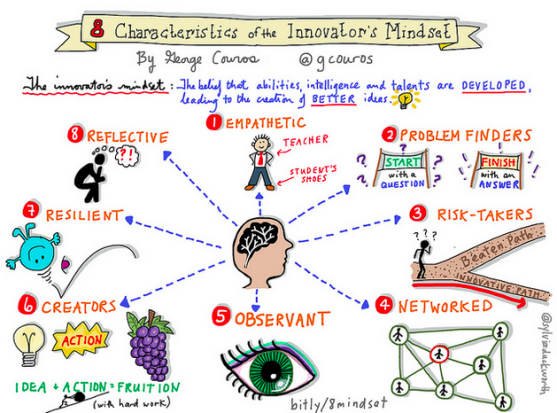 Here's to the future of better thinking, learning, and innovation when it comes to teacher PD! 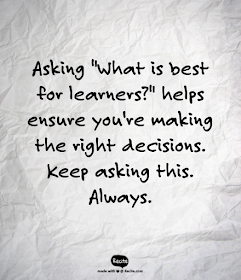 Great question -- one I struggle with as I design PD from a teacher's perspective, too. I have failed if I wouldn't want to hang out with me. Thanks for taking the time to read and comment. It's definitely an interesting shift from teaching students to teaching teachers! I wrote the same question in my blog for IMMOOC this week (https://reflectionsonleadershipandlearning.wordpress.com/2016/09/27/new-and-different-immooc/). I love how you plan your workshops and I agree with your ideas! Sit-and-get is not good for young learners OR adult learners. Expecting one person to give you all the answers does not promote independent, critical thinking (or much thinking at all!). Thank you for sharing! I used your post as part of my IMOOOC blog tour. Thanks for inspiring my thinking.